Pretty in variegated or solid coloured cotton cloth and easy to knit. A great gift item and can be made in an afternoon. Row 7: K2, *yo, k2 tog, k6, repeat from * end last repeat k4. 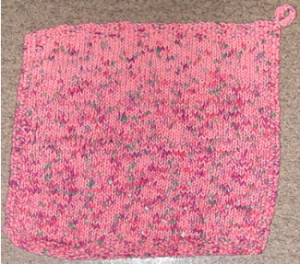 Using size 4.5 knitting needles cast on 54 stitches and knit 5 rows in border pattern above. Keeping 3 sts at each end of row in border pattern work row one of pattern stitch. Continue eyelet pattern for 10.5 inches or desired length. Knit 5 rows in border pattern across all stitches.Cast off in pattern until you have 1 stitch left. E-cast on 2 stitches work I-cord long enough for hanging cast off last 3 stitches and fasten to corner of cloth.